Lariosaurus was an extinct genus, which belonged to the suropterygian family. It is known to have lived during Triassic period. This dinosaur received its name from Curioni in the year 1847. It is known to have belonged to the nothosaur order. The term Lariosaurus was derived from the Greek word, the meaning of, which is lario lizard. This term is pronounced as lah-ree-oh-sore-us. Lariosaurus is known to have possessed small flippers and short neck as compared to its relatives. Its hind limbs are known to have possessed five-toe feet, while its front legs were paddles. The stubbier toes and the shorter neck of Lariosaurus might have limited its swimming ability to a certain extent. It was basically a water living dinosaur, but it has been found that it would have spent time in land as well for hunting prey. It has been found that Lariosaurus can grow up to a length of 60cms (i.e.) 2 feet. From the fossils of Lariosaurus, it has been found that it had two juvenile placodonts, with the help of which the researchers assumed that it might have had the same diet as nothosaurs. The fossils of Lariosaurus were found at the coastal areas of Western Europe . Apart from Europe the fossils were found in Spain , China and France as well. It was an aquatic reptile that might have lived in coastal and brackish waters. Lariosaurus was distinctly un-hydrodynamic with its short legs and arms, knobby body and primitive flippers. From this statement is very clear that it was the first among the other breed of aquatic reptiles like pliosaurs and plesiosaurs of the Cretaceous and Jurassic periods. 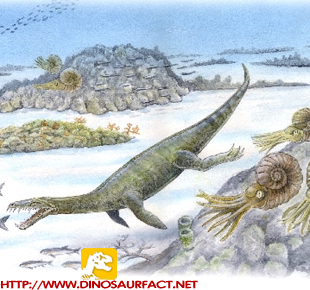 Apart from its ancient derivation, Lariosaurus was noted to be the smallest aquatic reptile discovered so far. This reptile was very small and later other dinosaurs, which came under this category were somewhat bigger as compared to this swimming lizard. • The skull of lariosaurus is elongated and it had a very long postorbital region and elongated upper temporal fenestae. The anterior teeth and the rostrum are interiorly constricted interlocking each other when the lariosaurus closes its jaws. • The vertebral column consisted of at least 39 caudal, 5 sacral, 20 dorsal and 22 cervical vertebrae. But, these figures differ from another dinosaur of the same family called lariosaurus balasamii. • The dorsal ribs are pachyostotic and the cervical ribs show a distinct anterior process. • The caudal ribs do not extend beyond 15-16 caudal vertebra and decrease in length rapidly. • As in other lariosaurus the front limbs would have been stouter than the hind limbs. It would have used its fore limbs effective for the purpose of swimming. • It would have had a stout hemerus. • In lariosaurus the researchers found a peculiar ulna (i.e.) the radius of the ulna is narrower and it is greatly broadened. In between the ulna and the radius there was a wide spatium interosseum. From the above points, it is clear that lariosaurus was very primitive as compared to other members of its family.